Although we offer over 6000 fabrics samples in our showroom, you aren't required to purchase the upholstery fabric from us. Beware of any "steals" on fabric you may find at retail fabric stores - when it comes to upholstery fabric, you want to make sure you buy something that will last more than a few years. Design tips for selecting fabrics: Not everyone has an interior design degree or even enjoys the decorating process. When you are ready to reupholster your favorite pieces there are a few things to keep in mind when selecting fabrics. Aesthetics: This includes, appearance, feel, color, texture and/or pattern. These things are usually the most important considerations when selecting fabrics. Depending on the piece or pieces you are doing and the other things in the room that will remain unchanged ie; carpet, paint, drapery treatment, lighting and other furniture - choosing the right new fabric to go with everything else can be most difficult. The size of the item to be done will limit the size of a pattern that should be applied. The number of patterns vs. stripes, and solids in a room should be considered. The feel and texture of fabrics will be a main concern also, considering you will be having daily contact with them. Durability & Quality: There is a very wide range of fabrics available for upholstery work. Today's fabric mills are producing state of the art materials, including many new fibers designed for durability, as well as natural fibers such as cotton and silks, and blends of all of the above. The quality of a fabric is determined by the fiber, how tightly it is woven, and design details. Price does not necessarily equate to quality or durability. Some of the least expensive nylon or nylon blends have the best wearability, but have a very commercial feel and look. Where as the most expensive silks must be very carefully placed and maintained to last at all. W - Water base upholstery cleaner only. S - Solvent base upholstery cleaner only. SW - Water base or solvent base cleaners. X - Do not clean with either water base or solvent base cleaners; use vacuuming or light brushing only. These codes are meant for the outercovering fabric only. Overwetting should be avoided so as not to affect the filling materials. Zippered covers should not be removed for cleaning as excessive shrinkage may occur; zippers are used to facilitate filling the cushions, not to facilitate cleaning. Cost: Upholstery fabrics will range from $35.00/yd to $135.00/yd typically. The average price range for a good quality fabric is about $55.00/yd to $90.00/yd. There are many sources of mill-end and factory reject fabrics that can be purchased at discount prices, however, if you choose to use these - look over every square inch for flaws - we usually cannot cut around them. For help in selecting your new fabrics, please stop into our showroom at 2400 W. Belleview - we have over 6000 large wall hanging samples and hundreds of books on hand. Bring with any items you may be trying to color coordinate with, such as carpet sample, arm caps off of other items, toss pillows or paint chips. It really helps in starting the search. 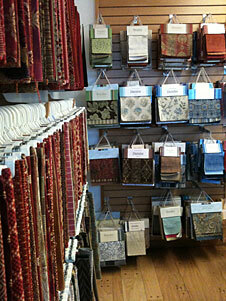 Our showroom staff are all qualified to help you find the right fabric! If you have any questions, please call us at (303)798-3220.